I have done a fresh install of Ubuntu 14.10 and SMB printing seems to be missing. 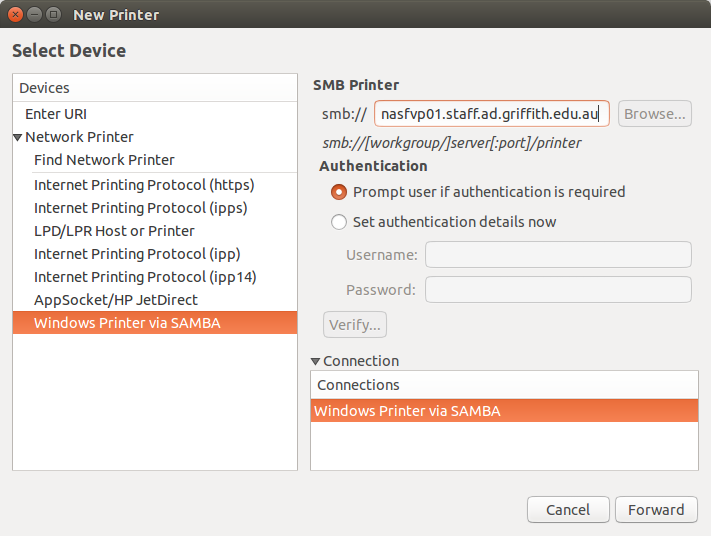 There was no SAMBA option for adding a network printer, after Googling, I installed libsmbclient, smbclient and python-smbc which seemed to give the functionality back. Now, the browse button next to where you paste the printer server is disabled (greyed out), you can see this in my picture below. From more Googling, this seems to be an issue with python-smbc or its detection by system-config-printer-common. The "verify" button also stays greyed and disabled after clicking the "set authentication details now" radio button and entering the username and password. Though it never used to actually verify anything and it would actually stuff up my credentials, I had to just click forward after selecting my printer and entering the correct password etc without verifying it. Previously, the SAMBA printer feature would be there by default (from memory) without me installing it. I could just add a SAMBA printer on my university network on my laptop by clicking "add printer" button, clicking the arrow for network, clicking "windows printer via samba", pasting in the server name, clicking browse next to it and selecting the printer I want. I would have to manually select its brand and then the Ricoh model number etc and it would work. I would have to edit the PPD file to add my own usercode as that is how they track how many pages we print. Python-smbc seems to give the browse functionality to log into the server address pasted and then for the list of printers to appear. Using the nautilus file browser, I can log in and browse to that same printer server and see the print$ folder so I assume its just something to activate the browse button. And you should be good to go. Restart "system-config-printer" to make sure the new dependencies get used. I had the same problem, but installing python-smbc and python3-smbc did not help. I added my experiences on the bug page as well. A workaround for me was to enter the exact host name and share name in the text field, so it reads "smb://hostname/sharename". I had to go over to the Windows server and find the field that says "Share this printer as...". Not the answer you're looking for? Browse other questions tagged networking printing samba or ask your own question.